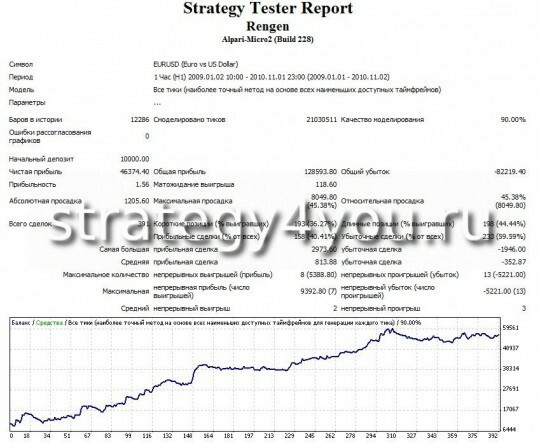 Another strategy forex Dr. Elder «Roentgen Elder» (remember that the earlier we saw 2 of his strategy: Forex Strategy on 3 screens and Forex Strategy» Momentum Elder»), the currency pair can be any recommended timeframe — H1, testing forex strategy was conducted on the EURUSD (H1), USDCAD (H1), GBPUSD (H1), so the reports on these couples I give at the end of the strategy, other currency pairs also yield profits, but profits from them are not too stable. 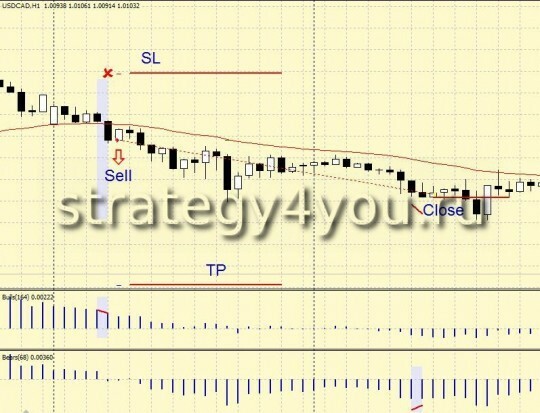 In this strategy, forex basic idea is that by seeing the Bulls and the Bears by using Metatrader 4 indicators, or rather knowing the balance of power in the purchase and sale, it is necessary to carry out the deal so that our trade position has always moved in the direction of the dominant at the moment direction, ie the prevailing trend. For example, we consider the USDCAD currency pair and all options will be given only for her, for other currency pairs are the parameters of the indicators may differ, they should select, based on historical data. 1) BearsPower (68) — it is calculated as follows: the current low of the candle is subtracted from the exponential moving average (EMA). The result of the difference is displayed as a histogram. EMA (34) will serve to confirm the signal if it is pointing up — open the deal to buy if it is directed downward — we conclude the transaction on the sale. Or rather — if the price of a one-hour candle closed above the moving average — are considering a deal just to buy if the price closed below the moving average — are considering making deals to sell. 1) bars (histogram), the indicator Bears are in negative zone, ie below its zero level and grow, ie previous column is lower than the next! 2) The price crosses the moving average and at the closing hour of the candle is above average! 4) Stop-loss is set at the nearest local minimum. 5) Take-profit establish the magnitude of 2-3 times more than the value of the resulting stop-loss. 6) Also, if you wish, you can use a trailing stop (Universal trailing stop, trailing stop on a trip or a standard Metatrader 4), placed at a distance of 30-50 points (for a 4-digit DC — type Forex4you or 300 -500 points for 5-znachnyhDTs — Alpari-type) depending on the stop-loss and the chosen currency pair. 7) Exit out of the deal going on stop-loss (negative or positive), take-profit or the reciprocal signal Indicator Bulls (for the transactions to purchase, for transactions in the sale — the indicator Bears). 8) Just do not forget to observe the Money Management! Indicators for Metatrader 4: BearsPower, BullsPower, EMA (Exponential Moving Average) do not spread because they are present in every terminal MT4 default. See here: How to install MT4 template on schedule? Note: if you want to receive updates Adviser - LEAVE positive feedback in the store Plati.ru without specifying e-mail in the body of reviews! 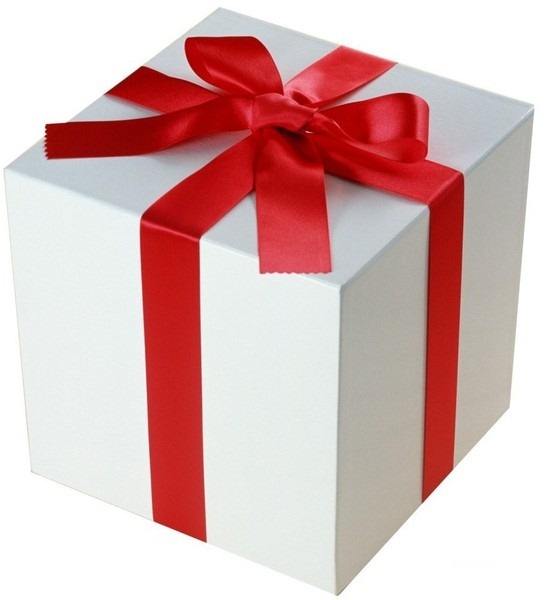 e-mail please indicate on the payment page — which indicates where the goods will be delivered!